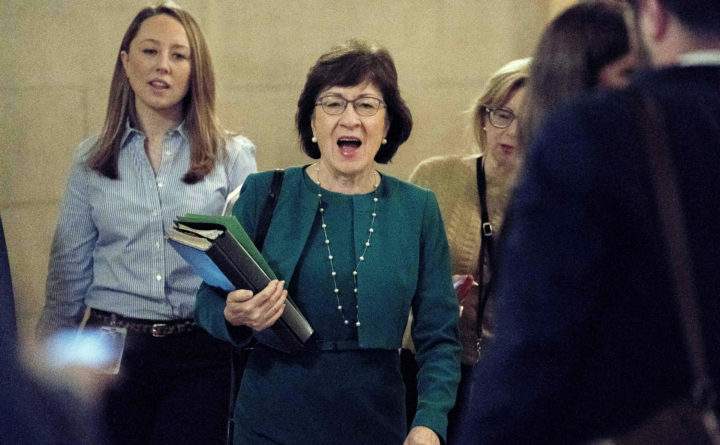 Sen. Susan Collins, R-Maine, center, arrives as Republican senators gather to meet with Senate Majority Leader Mitch McConnell, R-Ky., on the GOP effort to overhaul the tax code on Capitol Hill. House and Senate Republicans reached an agreement on a tax bill that they hope to pass in coming days so they can end the year with a legislative accomplishment. Some harmful provisions, such as a huge tax increase on graduate students and an end to the deductibility of student loan interests, have been removed from the bill. But it remains a huge giveaway to the wealthy and large corporations that will run up the deficit. A “no” vote is appropriate. Sen. Susan Collins, who is even more critical to Republican leadership after Democrat Doug Jones won the Alabama Senate seat, has worked hard to make the bill better for Maine people. The conference bill includes a Collins provision that allows people to deduct up to $10,000 in state and local property taxes from their federal income taxes. However, the bill also doubles the standard deduction so the the number of tax filers who itemize their deductions is expected to fall from 29 percent to 6 percent if it becomes law. A provision backed by Collins would allow people to deduct a higher amount of medical expenses from their federal tax bill. A third Collins’ provision would allow public and nonprofit employees to continue making catch-up contributions to retirement accounts. We applaud Collins for her work to improve the bill. These provisions will help specific groups of people, but overall, the GOP tax plan will not help low- and middle-income Mainers and Americans in the long term. Instead, it is heavily weighted toward large corporations and the wealthy. Like the majority of economists, we also do not believe the tax cuts will spur economic growth that would cover their $1.5 trillion cost. For these reasons, we continue to believe the tax bill currently before the House and Senate should be rejected. Then, there is the issue of the individual mandate in the Affordable Care Act. Under the mandate, Americans must purchase health insurance or pay a fine. The tax bill repeals the individual mandate, which the nonpartisan Congressional Budget Office predicts will cause 13 million Americans who are now insured to lose their coverage. Collins has spent weeks seeking ways to ameliorate the impacts of the repeal. She received assurances from Senate Majority Leader Mitch McConnell that the Senate would vote on two provisions that may lessen the negative consequences of repealing the mandate. A recent analysis by Oliver Wyman Health found that the provisions, which would allocate $5 billion a year in 2019 and 2020 to states to help them stabilize the individual health insurance market and would continue payments to reduce insurance premiums, would reduce premiums and bring additional people into the market. Other analyses conclude that Collins’ provisions would lessen, but not eliminate, the impact of the mandate’s repeal. But House Leader Paul Ryan has said he was not part on an agreement to vote on these provisions and conservative House leaders say they will not back a temporary spending bill, which lawmakers hope to pass this week, that includes these provisions. Congress is expected to vote on the tax bill before the spending bill, leaving the status of the changes sought by Collins in doubt. Collins was hailed as a savior of health care with votes this summer to block the repeal of the Affordable Care Act. She was the first Republican senator to announce she would vote against the repeal and consistently did so throughout the summer. Allowing the individual mandate to be repealed without first putting in place law changes to limit the negative impacts would undo that hard work and those principled votes. Collins would be taking a huge risk to vote in favor of the tax plan with so much uncertainty about her health care provisions. Given the huge flaws in the tax plan, that is not a risk worth taking.